A paw print cake is the perfect dessert for a dog themed birthday party, whether the guests have four legs or two. Use a paw shaped cake pan! 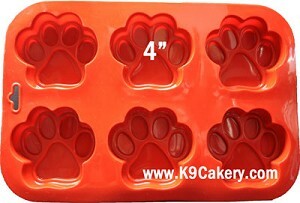 Silicone cake pans with cells in the shape of paw prints come in several sizes. These pans are made out of FDA approved silicone. 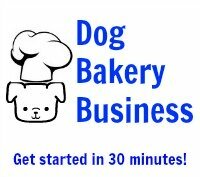 They can be used in the microwave to make microwave dog treats, in the conventional oven for baked dog treats, placed in the freezer to make frozen dog treats, and even washed in the dishwasher. Try to crumple them up - they will spring back to shape and can be used again and again! Your cleaning efforts will be minimized because you just throw them in the dishwasher when you are done and you can use them over and over. 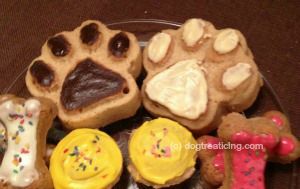 With the mini paw print design, make small dog treats, dog training treats, or little frozen dog treats. If you have dog lover friends, surprise them with paw print ice cubes! The mini paws are 1.5" (inches) across in size. 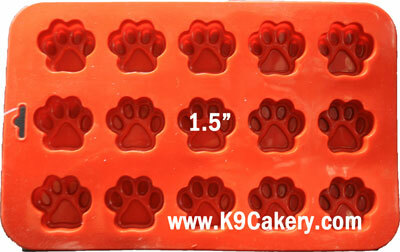 With this next paw print pan, make a cake for dogs so that each dog gets his or her own special dog treat. Each dog can have his own cake! Place a candle in one of these paw shaped cakes and you have the perfect dog birthday cake for a small dog. These silicone pans are made with 100% FDA approved silicone. They retain their shape no matter how much abuse they receive. It's OK if the dog grabs the pan and carries it off to lick it clean - the pan can be crumpled and it will bounce right back to its original shape. One of the best features of these pans is that you can throw them into the dishwasher and not have to spend time scrubbing. These silicone pans are very versatile. Fill the molds with water or your favorite fruit drink for ice cubes in a paw shape You can even freeze broth.. Then serve to your two-legged guests. This is the perfect touch to a day spent watching the dogs play while sipping ice tea or your favorite fruit drink. 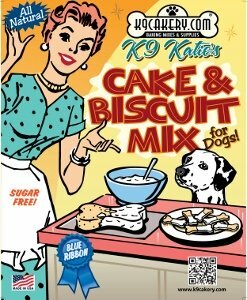 Click here for more about dog cake and here for dog cake recipes.